There are currently 35 users and 1600 guests online. Chivers Only - 10 Year Warranty | LAST DAY LEFT!! Today, Wednesday 31/10 is the last day left that we can offer this promotion - Call us today to secure it! Exclusive to Chivers Marine only | The Perfect 10 Promotion! Evinrude already offers best-in-class fuel efficiency, best in class torque, no-break in period and no oil changes ever- add 10 years warranty and you've got yourself a deal unlike anything else! 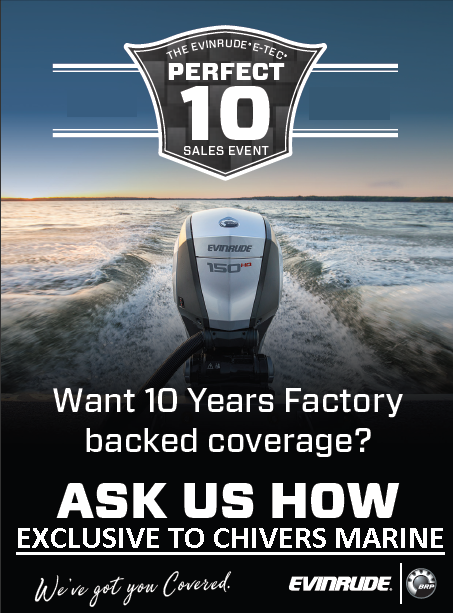 The 10 Year Factory Backed Warranty is only available through Chivers Marine for 10 days only - Deal finishes on 31/10/2018 and can not be extended. And as always guys, ask for a Fishwrecked price!